Do you like tapas? These little banderillas are a tapa, the Spanish version of hors d’oeuvres. The name banderilla comes from the colourful, barbed darts used during bullfights. Small toothpicks with a frilly end are perfect for banderillas. The idea is that they should be eaten in one bite letting the flavours come together in the mouth. Perfect stand up party food. Assembled on a toothpick it is a little collection of tidbits like olives, pickles, vegetables, fish or meat. Served at room temperature they are most often made of canned or bottled ingredients so make an easy last minute appetizer. Dipped in or drizzled with a tiny bit of homemade mayonnaise these simple banderillas are surprisingly delicious. If you like pickles these are definitely for you. There are no rules for banderillas. Assemble the toothpicks in any order putting about four little morsels on each one. I’ve listed many ingredients for you in the recipe but here is a hint. If you want this to be easy stick with firm foods right from the jar like pickled onions, stuffed olives and pickles. If you want more variety include cubes of cooked potato, fish, meat or anything you like. Personally I gave up on the chunks of tuna and hard-boiled eggs. They break too easily. I prefer all vegetables but when I was shopping to make these I saw a package of chorizo slices in the deli marked gluten free. Folded over they went on the toothpicks easily and were tasty. Homemade mayonnaise is an easy project. Really! It is simply made with egg yolks, mustard and oil in a food processor or hand blender. The key is to add the oil slowly, especially important at the beginning of the process. This guarantees a thick, velvety smooth mayonnaise. The recipe makes way more than you need so expect to make some decadent egg salad and tuna salad for lunches the week after you do this. After a trip to Spain many years ago I bought Penelope Casas book, Tapas: The Little Dishes of Spain and I’ve been enjoying tapas ever since. These were inspired by her book. 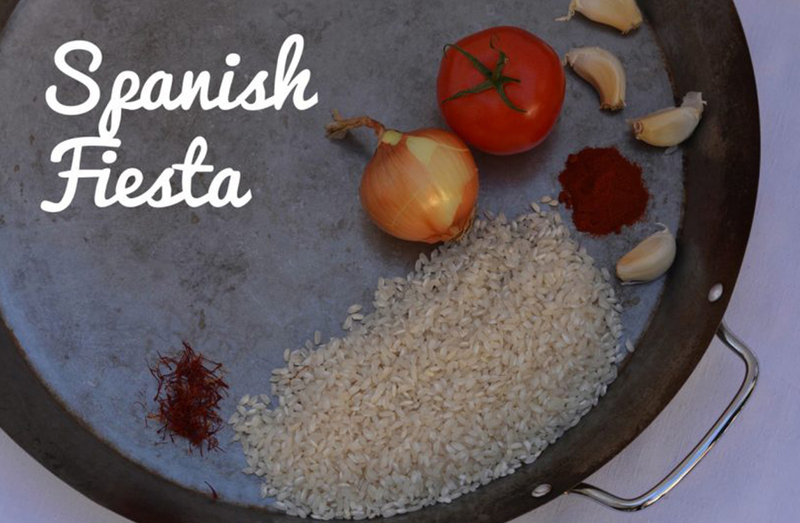 If you like paella and tapas why not host a Spanish Gourmet Dinner Club night. Let me know in the comments below if you made tapas or created a whole menu around them. These are suggestions, use at least 4 or 5 of any of the following foods. Assemble 4 pieces of any of the foods listed, in any order, on a small toothpick. Arrange on a platter with mayonnaise for dipping or drizzling. In a food processor combine the egg, Dijon, salt and lemon juice. Process until smooth. With the motor running add the oil in a slow steady stream. Serve with banderillas.